Home > Check-in Station, Episode by Episode	> Kamisama Dolls ep1: it’s not set in a high school? There are adults and people get murdered? OK, I’m in! Kamisama Dolls ep1: it’s not set in a high school? There are adults and people get murdered? OK, I’m in! I’m down for a good twisted story every now and again, and some more later. It adds an appropriate measure of tension and finality to the episodes. And despite a few cutesy things here and there. The narrative seems relatively serious and straightforward. 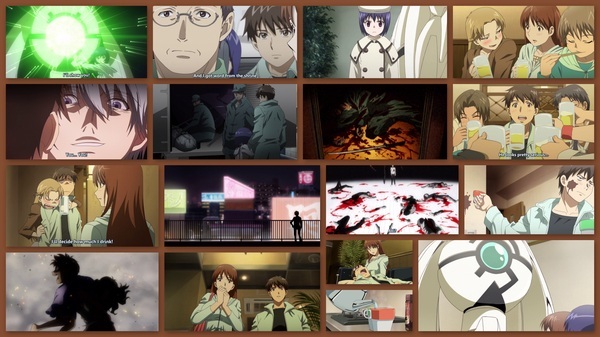 Albeit, this first episode still goes through the usual first episode trappings and annoyances of vague disposition and dialogue throughout, sprinkled heavily with foreshadowing and metaphor. But I’m quickly, and comfortably settling into the world of Kamisama Dolls. So the show starts out in spectacular flashback with what is easy to assume a flashback. Some monster runs through the woods blasting stuff with the gusto and panache of a monster from a Studio BONES production. *checks notes* OK! This is NOT a Studio BONES production. Glad I didn’t just assume so. It’s just that this show superficially reminds me of Xam’d a little bit. Anyway, it’s all very “explody” and bright and exciting but with a sad atmosphere. We see another monster show up seemingly to protect the people in this flashback. But as it ends, it doesn’t appear to have good consequences. Skip forward in the narrative (just past the opening theme and animation), and we see the boy from that flashback, grown up and attending what appears to be a very normal after hours company get together at a bar in Tokyo. He shares some moments with his coworkers, including with a girl that used to be from the village he came from. But his festivities end with too much drinking and bad karaoke. All is not lost however, as he awakes in the lap of the previously mentioned girl. They walk to the elevator. DEAD BODIES. LOTS OF BLOOD. A KATANA. Nice! Now I’m interested. The flashback with all the explosions was nice, but this is better. It’s more tangible to me in the moment. The guy, Kyouhei Kuga escorts the woman, Hibino Shiba to her neighborhood after they’ve called and talked to the cops about the massacre in the elevator. Kyouhei gets a nice little flashback thinking about the familiar things he’s seen in the elevator. Looks like he left the village under less than what he thinks are gracious terms, abandoning some sort of responsibility. He has a little (what I thought at the time was a brother) sister who appeared to be very sad he was leaving, too. Surprise! He meets his sister again in that elevator, along with the monster that tried to protect them in the flashback at the beginning of the episode. She’s very clumsy with her monster, or god as I guess we should call it from now on. 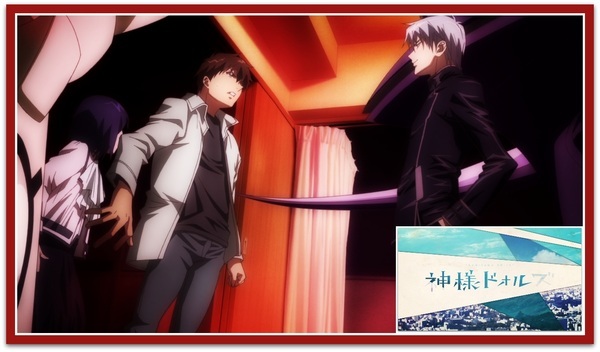 They go to his apartment where they talk and Kyouhei learns that a very dangerous person from his village has escaped, leading him to blame himself for some reason. It’s pretty cool because at this point I notice that these gods seem to have a song they sing when they appear. And we get to meet Aki and his god, something that looks like it came from a Zeon workshop during the Gundam 0079 series. Aki reminds me of Accelerator for some reason. He just has that psychotic look to him. Aki’s appearance starts a battle between him and Kyouhei’s little sister, Utao Kuga that isn’t in Utao’s favor AT ALL. Despite Utao being outclassed, she wins using the ill-advised technique of firing a blast from her god INTO Kyouhei’s apartment with him in it. Goodbye apartment and good recommendations for your next one. The web begins to get uncovered though, as we learn that Hibino’s dad and Kyouhei’s boss is still well connected to the village. And that envoys from the village are quick to pick up the incapacitated Aki. Kyouhei finds this annoying, as he sees it as the village still keeping dibs on him and controlling his life. Things are explained to Hibino later on, and the episode generally ends… well, it doesn’t actually end until we get a glimpse of the crashed truck that used to house Aki. Overall, an interesting episode that didn’t spend too much time on trying to impress the viewer or on trying to be coy and mysterious. We got action and mystery, good animation and somewhat interesting soundtrack. I’ll be interested to learn a few things about this show. How many of these “Seki” are there that can control these “gods”? What’s the point behind the village and all this hidden power? What was it that made Aki and Kyouhei the way they are, and why does Aki view Kyouhei as a rival? I’m also interested to see how dark this show will get and what’s the point behind this show. Well, what’s the point of it besides entertainment and making money, of course. Another interesting recommendation from what people have told me is one of the best series from 2012 that I did not see. I’ll easily give this a five episode test.